If you could have a home anywhere when you retire, where would you choose? For this East Coast client, their choice was Sonoma, California, and while we may be a bit biased towards Wine Country, we don’t think they could’ve chosen anywhere better. 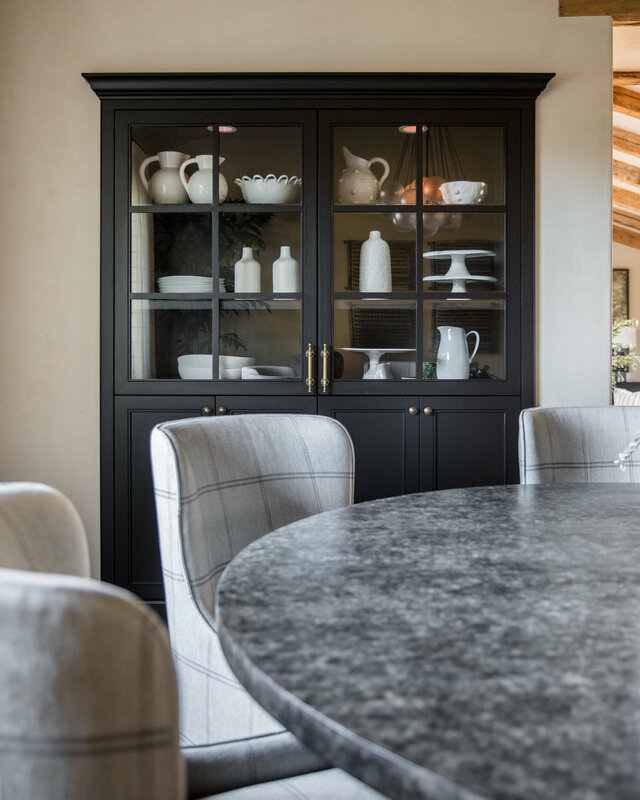 After finding a house that they loved, we spent eight months redesigning this Sonoma ranch into the ultimate Mediterranean and Wine Country-inspired retreat—a place our clients now call their “Heart House.” Given free reign and creative trust, we were able to create a transitional and classic space for their whole family to escape to. Surrounded by the incredible views of wine country, we used the natural palette of the environment as our inspiration and pulled subtle colors and textures from the landscape and views in the distance. The living room is one of our favorite rooms in the house with large matching sofas from Bright Chair covered in Kravet fabric. 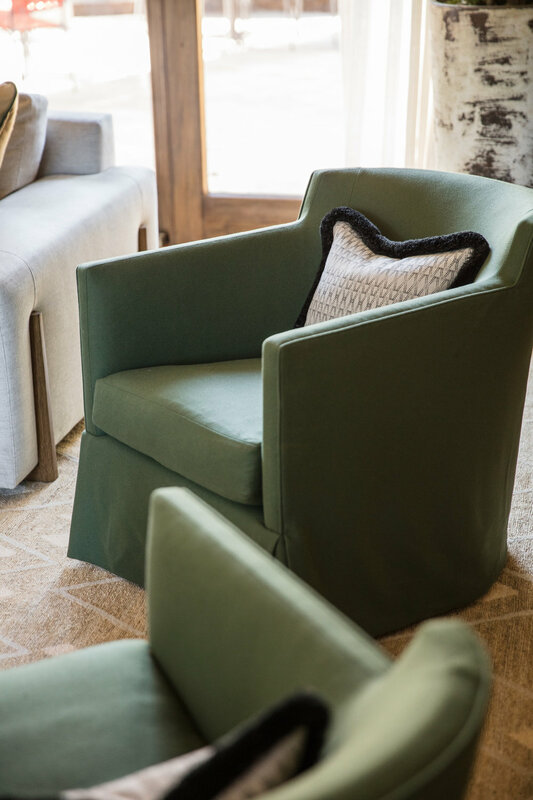 The two green swivel chairs are also from Bright with fabric from Holland & Sherry—adding that pop of natural color and balance to the space. The two matching charred wood cabinets flanking the fireplace came from FR favorite, Coup D’Etat in San Francisco and are designed J. Liston Design. The custom Crosby mirror from Ochre is another accent piece we love. Floating in the middle of the space, the striking coffee table and benches were sourced from the artful collection of Gregorius|Pineo. 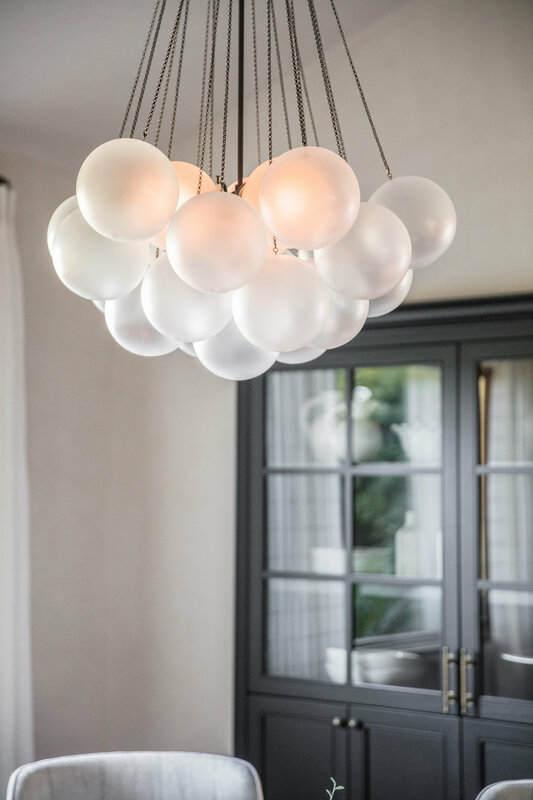 The Montel Pendant light that hangs above it all comes from Noir Furniture. Finally, the painting above the Fireplace is by James Kennedy. Without a lot of larger spaces for art in this home, this one was one one chance for a statement painting and we took it! One of our favorite pieces in the space is this incredible custom designed sculpture— ‘Fluid’ by Kelly Farley. 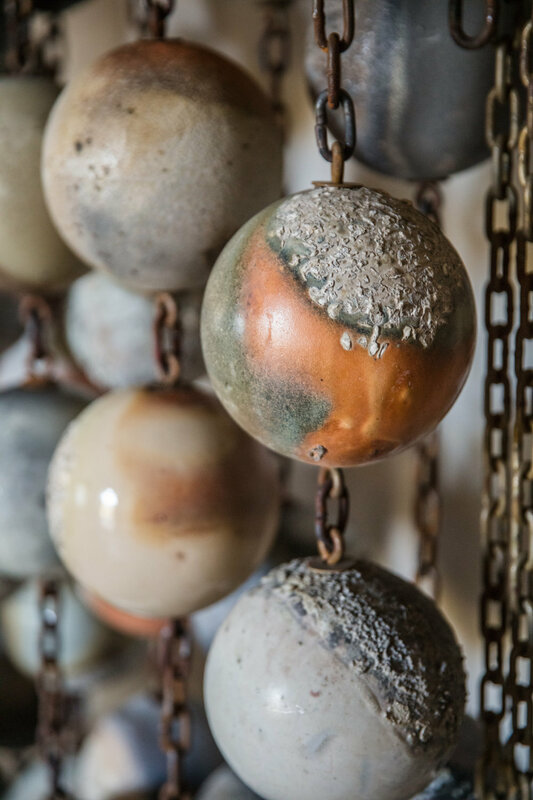 The ceramic spheres were fired in a Japanese style kiln called Anagama and placed on oyster shells. Over the long firing process, the shells infused into the spheres, giving each one a unique color and texture. After being hung from oxidized steel chains, this show-stopper was born. It provides guests with a unique and colorful welcome in its rightful place in the entryway, and it can be admired from several places in the home. The Powder Room features a unique wallpaper we love, Emeralds, by Jennifer Shorto. The pattern is actually composed of really cool looking scarabs. We finished the ceiling with the classic and timeless look of Venetian plaster. For the dining room, we continued with the timeless and neutral look to allow a seamless flow from one room to the next. Fit with a custom black built-in and comfy rolling chairs (hallway race anyone? ), this space makes for a warm and inviting spot for the family and guests to enjoy meals and stick around and enjoy each other’s company long after. The room also features one of our favorite lights, Cloud 19, by Apparatus Studio in NYC. We met them while designing our room in the San Francisco showcase house a few years back. We also love the dark pop of black the built-in adds in an otherwise bright and white plastered home.